This is a birthday card that I made. As I am addicted to using my Gelli printing plate I have a massive pile of monoprints waiting to be cut up to be used for cards and other art and crafting projects. I love using my monoprints in my card making as it makes the cards even more original and special. I printed the background using my Gelli plate. The paper picks up all the marks and textures that are on the Gelli plate, it can be quite surprising the amount of detail that can be achieved. 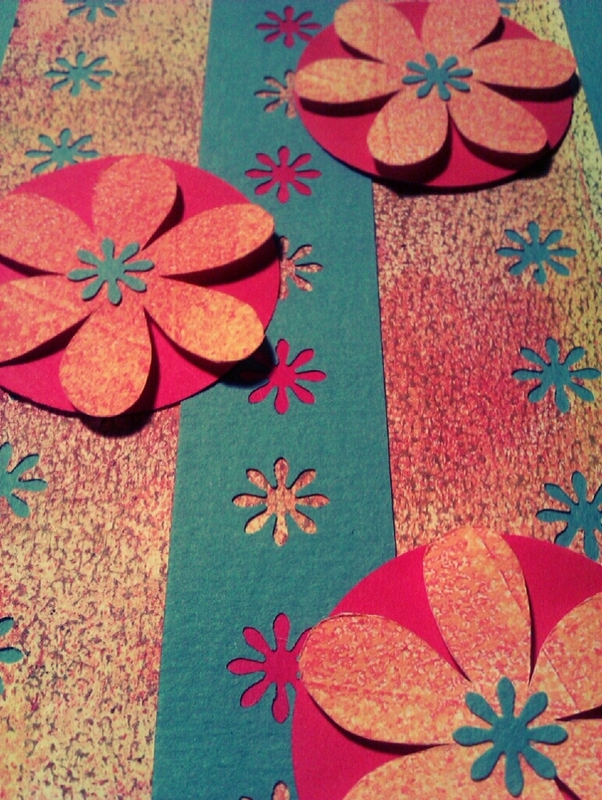 I cut-out the circles from red paper using my circle cutter, the red paper matched the red in the print and complimented the teal flowers. I used a stencil as a guide to cut-out the larger flowers from a monoprint and the smaller flowers were created using a little flower punch, punched out from textured paper. My art and the cards I make have become so much more colourful since using the Gelli plate, I have become braver with colour combination. I really loved how this card all fitted together. I hope you enjoy this weeks offering.